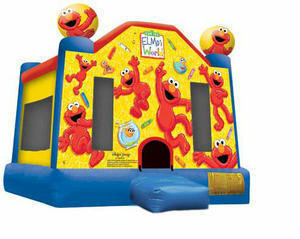 Actual Size: Length: 16'4" Width 15' Height 13'6"
Take a peek into Elmo's world with this Elmo fun jump! Providing just under 245 square feet of play area, multiple large mesh windows, and a safety step to enter and exit, this jump is perfect for your next event! Your guests will be "tickled" when they see this bright and colorful Elmo fun jump at your next party. Got Bounce? The Bouncing Buddies Elmo Inflatable Moonwalk is great for family entertainment, providing the most popular form of amusement for children. Bouncing also puts you in a state of health and fitness, improves your sense of balance, creates an aerobic effect for your heart, strengthens your muscles, and increases the capacity for respiration, resulting in better mental performance! -Moonwalk has large jump area.